"We chose Jocelyn as promotions manager because she stood out the second she came in for an interview. She is energetic, confident, creative and knowledgeable. We knew right away that she was the perfect fit for taking the Pittsburgh market to the next level and are thrilled that she is part of the team!" "It is clear that the SAEM program, and the University itself, takes full advantage of its prime Downtown location with strategic partnerships all over the city, providing endless internship and career opportunities for its students." 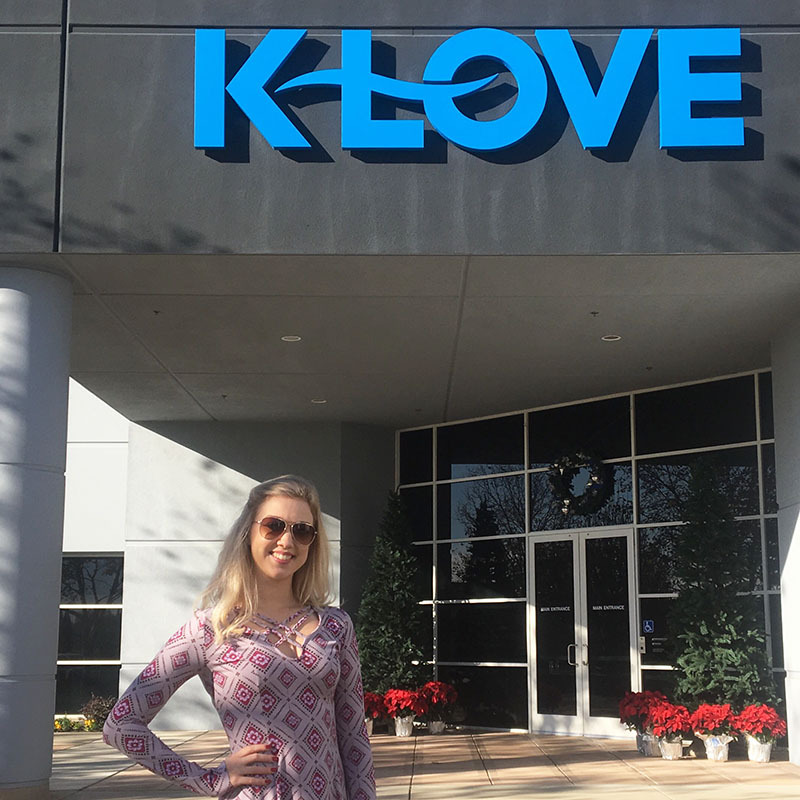 How did your SAEM degree help you land the position of promotions manager for K-LOVE radio? The SAEM professors at Point Park University are the heart of the program, and their dedication to student success was a daily motivation to me and others. My professors’ professional experience and insight in this industry was a huge asset to my education. They played a large role in personal mentorship throughout my college experience, internship placements, and the interview process after graduation. Through hands-on projects and presentations, my SAEM classes equipped me with the tools and knowledge I needed to jump right into a career in the entertainment management industry. What made my education unique and applicable was being able to take classes — such as Event Management, Business of Concert Promotion & Live Entertainment, Business Models of SAE, Marketing and Promotions for SAE, and many more — specifically focusing on the work I planned on doing in my intended career field. Having the ability to explore so many different avenues in the entertainment industry was what eventually led to my interest in radio promotions. My position encompasses a wide variety of responsibilities, but my main focus is to create and strengthen relationships with local nonprofits, churches, sports teams, and businesses in order to plan and promote events that enhance our listeners’ experience with K-LOVE and Air1 Radio. I also take part in and develop several community service projects throughout the year. The event work itself is the most important part of my job, as this is when I am face to face with our listeners and communities, representing the organization. Being on site for an event consists of engaging with both listeners and those who may not know who we are through informative activities, games, giveaways and of course, our music. I manage a volunteer base who accompanies us to most of these events. My lead and I work with the volunteers to be approachable, embody enthusiasm for our work and hold appropriate dialogue with attendees. Beyond event work and planning, I am responsible for working with tour promoters for on-air giveaways on all Western Pennsylvania, Eastern Ohio and West Virginia frequencies. I am also equipped with several other media tools and radio spots to market our events and partnerships. I chose Point Park University because of its unique SAEM program and the authentic, professional experience it offer its students. It is clear that the SAEM program, and the University itself, takes full advantage of its prime Downtown location with strategic partnerships all over the city, providing endless internship and career opportunities for its students. With Point Park having a relatively smaller student body, I could see there were a lot more opportunities to get involved with on-campus organizations at a higher level, along with being able to frequently attend professional seminars and panels pertaining to my field. After further research of SAEM alumni and how their education landed them in their professional fields, I was confident that Point Park would be the ideal university to begin my career. What internship and career-related experience did you have as a Point Park student? My professional experience began my sophomore year with an internship as an assistant agent at The Talent Group in the Strip District. In this internship, I explored the more artistic and legal sides of the entertainment industry. The following summer, I was hired as an events assistant at Phipps Conservatory and Botanical Gardens, which aligned closer with where I felt my interests were leading in my career path. Both my junior and senior year, I was fortunate to have served on the executive board of Point Park's Campus Activities Board, where I held event coordinator positions and led committees both years. This experience was monumental in my education at Point Park, as I gained a vast amount of knowledge and leadership, teamwork, finance and organizational skills. Any sunny day spent in Village Park was an absolute treat. Just being surrounded by the diversity of our student body and downtown atmosphere was great! A specific memory of Village Park that stands out was CAB’s Spring Fling event that I helped plan my junior year. Leading into finals week, we had a Jimmy Buffet tribute band, taco bar, inflatables and lots of other fun activities for the student body to enjoy!